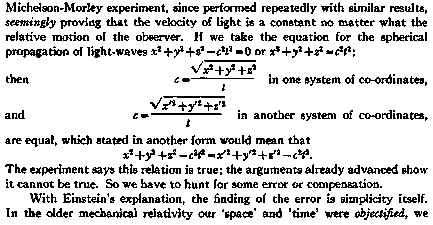 This extraordinary and unexpected inequality, because it contradicted structurally the classical mechanical principles of relativity, which apparently had been well established experimentally, created a baffling semantic situation which was profoundly unsatisfactory. What could we do about it? Should we abandon the older principle of mechanical relativity; or should we have two different laws, one for the older gross macroscopic mechanical relativity, and another for optical and electro-dynamic events; or should we investigate the fundamental structural assumptions which underlie our formulae, and see if the discrepancy is not due to some prejudice or some structural dogma which we have overlooked for centuries? If a solution of the last kind should be found it would naturally be most satisfactory. The admission of two relativities, one for the mechanical events, the other for the optical events, would be against the whole trend of science, which requires the unification of theories.